A new vSphere book has just arrived and has been added to my library. 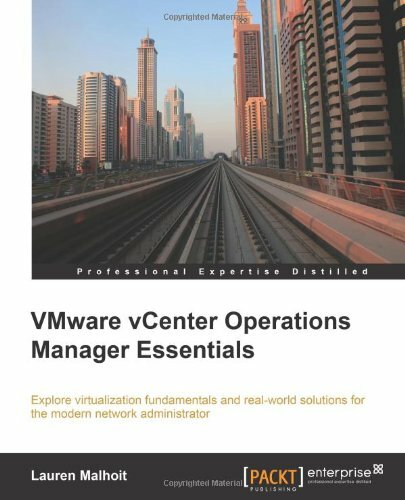 The book’s title is VMware vCenter Operations Manager Essentials which was authored by Technical Virtualization Architect and vExpert Lauren Malhoit (@malhoit) with reviews from Michael Poore, Mike Preston, and Chris Wahl. I ordered this book while attending Dell User Forum a few weeks ago where I did some breakout session speaking on vC Ops and the new Dell Storage adapters for vC Ops. Skimming through the chapter list covering 236 pages, it looks like it’s going to be a pretty good read. If you haven’t yet, grab the guide, take a look at it, and upgrade to vSphere 5.5 Update 1, hopefully in that order. In the past I recall these guides were spread out on somewhat sparsely on VMware’s site. What I hadn’t noticed until this morning is that VMware has now compiled all available vSphere hardening guide links onto a single landing page in addition to providing change tracking between each of the vSphere 5.x guides which I think is quite helpful. Are you a technical writer? Blogger? Presenter? If so, this could be a handy resource for you. It’s the VMware Trademark Guide. Probably more important for VMware employees and their partners, with varying or less importance to bloggers. I’ve seen a lot of citations with much justified debate around the spelling, capitalization, and acronymization of VMware products. I believe this document to be the official source that should clear up any confusion. The information is laid out in two columns: Brand Name and Approved Short Name/Acronym. Use only approved short names. Most importantly, do not use abbreviations such as VCOPS, VCHS, VCNS, VSOM, ITBM and SRM to signify VMware products or services. Some of the abbreviations are being used informally, but should not be used in public-facing communications. Wait… no VCOPS? No SRM? Apparently it’s true (at least for public-facing communications and perhaps that’s the line that has been grossly forgotten and crossed) and I’m just as guilty as the next person for perpetuating wrongness in the vCommunity (Can I say that? To my knowledge, VMware doesn’t own that term on paper and has no jurisdiction). Anyway, I don’t think the point is that people are going to get hauled off to jail for showing decks reflecting SRM and I’m quite sure this shorthand is still acceptable in social circles (with the added benefit of not being able to verbally screw up camel case). The idea behind the document first and formost is to recognize each of the VMware registered trademarks and their proper use. If nothing else, please identify the proper case and spelling of VMware. If you’re a technical writer with a professional affiliation with VMware, it’s equally important to understand VMware’s requested use of short names and acronyms presumably so that we can maintain some consistency throughout the industry, minimize the confusion, and hopefully not slaughter VMware’s brand. Taking a look at my VM Storage Policies compliance in the vSphere Client, I was alerted to a situation that none of my configured virtual machines were compliant with their assigned VM Storage Policy named “Five Nines Compellent Storage”. Oddly enough, the virtual machine home directories and virtual disks were in fact on the correct datastores and showed as compliant a few days earlier. None had been migrated via Storage vMotion or SDRS. 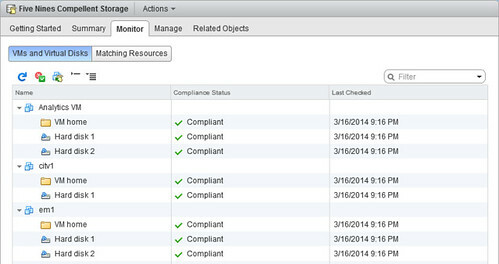 I then verified my VASA configuration by looking at the status of my registered storage provider. The issue was not so much that the provider was malfunctioning, but rather it was missing completely from the registered storage providers list. This indeed explains the resulting Not Compliant status of my virtual machines. I checked another upgraded environment where I know I had a registered VASA storage provider. It reflected the same symptom and confirmed my suspicion that the recent process of upgrading to vCenter Server 5.5 appliance to Update 1 (via the web repository method) may have unregistered the storage provider once the reboot of the appliance was complete. I had one more similar environment remaining which I had not upgraded yet. I verified the storage provider was registered and functioning prior to the Update 1 upgrade. I proceeded with the upgrade and after the reboot completed the storage provider was no longer registered. What remains a mystery at this point is the root cause of the unregistered storage provider. I was unable to find any VMware KB articles related to this issue. the integration requires the CITV appliance and Enterprise Manager 6.1 and above. the out of box Windows Server Firewall configuration which Enterprise Manager sits on will block the initial VASA configuration in the CITV appliance. TCP 3033 incoming must be allowed or alternatively disable the Windows Firewall (not highly recommended). Once the applicable storage provider(s) are added back, no additional VM Storage Policy reconfiguration is required other than to check for compliance. All VMs should fall back into compliance. Once again, I am unsure at this point as to why applying vCenter 5.5 Update 1 to the appliance caused the registered storage providers to go missing or what that connection is. I will also add that I deployed additional vCenter 5.5 appliances under vCloud Director with a default configuration, no registered vSphere hosts, registered a VASA storage provider, upgraded to Update 1, rebooted, and the storage provider remained. I’m not sure what element in these subsequent tests caused the outcome to change but the problem itself now presents itself as inconsistent. If I do see it again and find a root cause, as per usual I will be sure to update this article. To reiterate, Update 1 was applied in this case via the web repository method. There are a few other methods available to apply Update 1 to the vCenter Server appliance and of course there is also the Windows version of vCenter Server – it is unknown by me if these other methods and versions are impacted the same way. On a somewhat related note, during lab testing I did find that VM Storage Profiles configured via the legacy vSphere Client do not show up as configured VM Storage Policies in the next gen vSphere Web Client. Likewise, VM Storage Policies created in the next gen vSphere Web Client are missing in the legacy vSphere Client. However, registered storage providers themselves carry over from one client to the other – no issue there. I guess the lesson here is to stick with a consistent method of creating, applying, and monitoring Profile-Driven Storage in your vSphere environment from a vSphere Client perspective. As of the release of vSphere 5.5 going forward, that should be the next gen vSphere Web Client. However, this client still seems to lack the ability to identify VASA provided storage capabilities on any given datastore although the entire list of possible capability strings is available by diving into VM Storage Policy configuration. The Vendor Provider cannot run on the same host as the vCenter Server. In most cases, the vCenter Server as well as the VASA integration component(s) will run as virtual machines. Worded above as is, it would seem the vCenter Server (whether that be Windows or appliance based) cannot reside on the same vSphere host as the VASA integration VM(s). That’s not at all what that statement implies and moreover it wouldn’t make much sense. What it’s talking about is the use case of a Windows based vCenter Server. In this case, Windows based VASA integration components must not be installed on the same Windows server being used to host vCenter Server. For Dell Compellent customers, the VASA integration comes by way of the CITV appliance which runs atop a Linux platform. However, the CITV appliances does communicate with the Windows based Enterprise Manager Data Collector for VASA integration. Technically, EM isn’t the provider, the CITV appliance is. Personally I’d keep the EM and vCenter Server installations separate. Both appreciate larger amounts of CPU and memory in larger environments and for the sake of performance, we don’t want these two fighting for resources during times of contention. Judging by the search results returned by Google, it looks like my blog is among the few virtualization blogs remaining which does not have a writeup on this topic. It’s Friday so… why not. Admittedly I recalled the Certificate regeneration feature first by logging into the vCenter Server appliance management interface, but then verified with a search to ensure the purpose of the Certificate regeneration feature. The search results turned up Failed to connect to VMware Lookup Service – SSL Certificate Verification Failed (among many other blog posts as mentioned earlier) in addition to VMware KB 20333338 Troubleshooting the vCenter Server Appliance with Single Sign-On login. Both more or less highlight a discrepancy between the appliance hostname and the SSL certificate resulting in the need to regenerate the certificate to match the currently assigned hostname. I ran across another issue this week during the Update 1 upgrade to the vCenter appliance which I may or may not get to writing about today. At any rate, have wonderful and Software Defined weekend! VMware vSphere PowerCLI 5.5 R2 supports vSphere 4.1 through vSphere 5.5 as well as Microsoft Windows PowerShell versions 2.0, 3.0, and new in R2 4.0. Thank you Alan and thank you VMware! BOSTON, MA – January 27, 2014 – VMTurbo, provider of the only Software-Driven Control for virtualized environments, today announced a new version of its flagship product, VMTurbo Operations Manager, enhanced with control modules for storage and fabric to drive virtualized environments to their desired state and maintain control in that state across the data center and IT stack. These new solutions enable 30% improvement in utilization while providing greater control over all aspects of the environment the application workload touches – from compute and storage to fabric and cloud. One of the major advancements in this release is management of the Converged Fabric layer with Cisco (CSCO) UCS support. Not only does VMTurbo provide unprecedented visibility into UCS from the fabric interconnect down to individual blades, it also enables control of UCS to manage real demand for UCS ports to maximize port utilization and avoid unnecessary port licensing costs. VMTurbo is also disrupting enterprise software with its model of “easy to try, buy, deploy, and use”. Customers download VMTurbo Operations Manager and realize value instantly – unlike traditional management software which takes several months to install and perform after significant integration costs. In fact, VMTurbo offers customers a free health check assessment of their virtual environments. With VMTurbo, customers can break free from expensive, monitoring solutions that fail to eliminate reactive and labor-intensive IT fire fighting..
90% of customers that have implemented VMTurbo’s Software-Driven control system to manage their virtualized data centers and cloud infrastructures report a return-on-investment of less than three months from purchase – an unparalleled breakthrough disrupting traditional enterprise management software (Source: TechValidate). VMTurbo was recently recognized last week by Forbes as one of 2014 America’s Most Promising Companies. Earlier in the year VMTurbo received the JP Morgan Hall of Innovation award, being named one of the most innovative technologies in the data center. VMTurbo Operations Manager is the only product on the market understanding application workload performance, resource utilization and constraints in virtualized datacenter and cloud deployments to drive an organization’s environment to its desired state – that state of perpetual health where application performance is assured while maximizing efficiency – while providing control over all aspects of the environment the application workload touches, from compute and storage to fabric and cloud. While competitive solutions focus on viewing – monitoring systems to send alerts requiring operational staff to troubleshoot and remedy issues – VMTurbo Operations Manager ties the viewing with the doing, so IT Operations staff can elevate their focus from reactive to strategic. To try VMTurbo Operations Manager in your own environment, visit www.vmturbo.com/download or for a free health check assessment, call 1.877.978.8818 . For more detailed information on VMTurbo Operations Manager, visit vmturbo.com/operations-manager. VMTurbo’s Storage Control Module ensures applications get the storage performance they require to operate reliably while enabling efficient use of storage infrastructure – thus preventing unnecessary over provisioning. This module helps users solve their pressing storage performance and cost challenges, maximize their existing storage investments and embrace the adoption of advanced features and packaging such as NetApp Clustered Data ONTAP (cluster mode) and FlexPod. For more detailed information on VMTurbo Storage Control Module, visit www.vmturbo.com/storage-resource-management. Modern compute platforms and blade servers have morphed to fabrics unifying compute, network, virtualization and storage access into a single integrated architecture. Furthermore, fabrics like Cisco (CSCO) UCS form the foundation of a programmable infrastructure for today’s private clouds and virtualized datacenters, the backbone of converged infrastructure offerings from VCE vBlock and NetApp FlexPod. VMTurbo’s Software-Driven Control platform enables organizations to manage cloud and enterprise virtualization environments to maximize infrastructure investments while assuring application performance. VMTurbo’s patent-pending Economic Scheduling Engine dynamically adjusts configuration, resource allocation and workload placement to meet service levels and business goals, and is the only technology capable of closing the loop in IT operation by automating the decision-making process to maintain an environment in its desired state. The VMTurbo platform first launched in August 2010 and since that time more than 10,000 cloud service providers and enterprises worldwide have deployed the platform, including JP Morgan Chase, Colgate-Palmolive and Ingram Micro. Using VMTurbo, our customers ensure that applications get the resources they need to operate reliably, while utilizing their most valuable infrastructure and human resources most efficiently. For more information, visit www.vmturbo.com.